Mae's Cafe is about the good and the bad, the loves and heartbreaks, the scandals, and the friendships. Welcome to Chance takes you full circle in a fictional world of people who feel so familiar, it's like you've lived there all your life, too. Welcome to the quaint, coastal New England town of Chance, where nothing and no one is entirely what they seem. 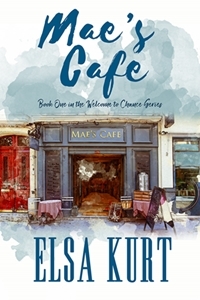 In book one, Mae's Cafe, we meet Mae, the beautiful young owner of the charming retro cafe. Still grieving the death of her larger than life father, she throws herself into her work and ignores the looming problems threatening her fragile peace. Bruce is the man hopelessly in love with her, waiting patiently for her to notice him. Handsome, enigmatic William Grant comes unexpectedly into town and turns everyone's world upside down... especially Mae's. As if that weren't enough, add the troublesome Feather Anne, who seems determined to ruin Mae's life at any moment. Welcome to Chance is a window into small-town life, where everyone knows your name and your business. Along with Mae and company, you'll also meet Rosabelle and Miles, the Jacobsons, the 'we used to be cheerleaders' moms, the Brightsiders, and more. Their stories will pull you in and make you feel at home. So much so, you'll wish you were there. 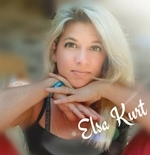 Elsa Kurt is a multi-genre, indie & traditionally published author, brand designer, life coach, and motivational speaker. She currently has seven novels independently published, as well as three novellas published with Crave Publishing in their Craving: Country, Craving: Loyalty, and Craving: Billions anthologies. She is a lifelong New England resident and married mother of two grown daughters. When not writing, designing, or talking her head off, she can be found gardening, hiking, kayaking, and just about anywhere outdoors.